A Planetary Nebula near the top of Cygnus, till recently at least. Not that it has disappeared, but that it has been reclassified as an HII region, an Hydrogen II nebula. It's also in the Abell catalogue as Abell71. It's the brighter red disc in the middle of the frame. 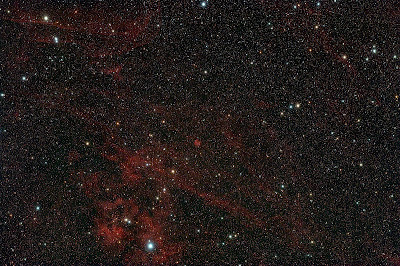 I took 26 frames of 300sec of this, thinking I'd get a small planetary in among lots of stars, but found that the exposure, just over 2 hours wasn't nearly enough, but whetted my appetite having uncovered Sharpless SH2 115 in the same frame, that's the bright extended red nebulosity at the lower central left. I'll have to get more data to add to this or restart with the centre lowered to cover the Sharpless nebula more centrally. There's so much nebulosity at the top of Cygnus. I'd relied on my hardware to find the planetary and centralise it but couldn't see any sign of it in the individual frames till stacked. Guiding was done with PHD, success finally, and I like the results, but have to remember it doesn't like faint stars. Taken 18.7.13 from the Austerfield Observatory, with the M25C and Tak106, then processing in Astroart and Photoshop. 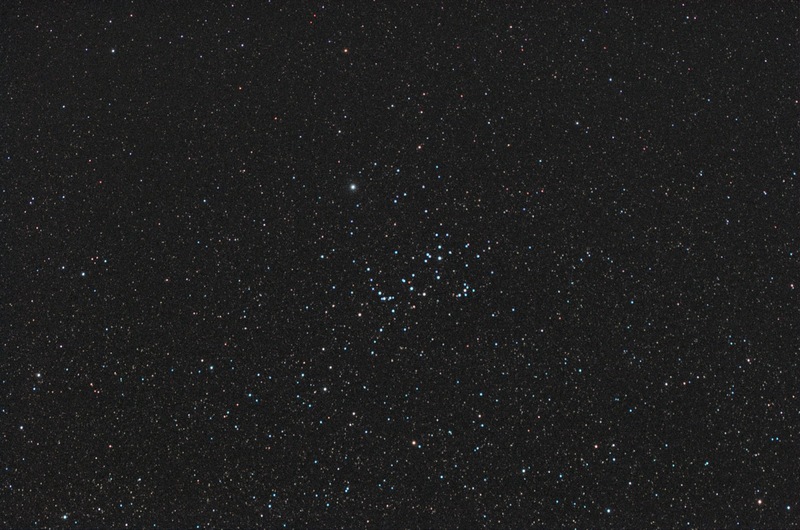 This was taken on 16.7.13 from the Austerfield Observatory, using a Tak106 and M25C. The guiding was done with an H9C in the Vixen260 controlled by Astroart. I've been trying to get PHD to work for me but have so far failed, I think because the stars seen through the Vixen have mostly been too small for PHD, though Astroart manages with them. We've had a heat wave recently lasting for several days, and we're not used to it. It has filled the skies with haze and dust so photography has been compromised severely, even though there haven't been any clouds. I've also been trying to get my DSLR to perform, again without success. 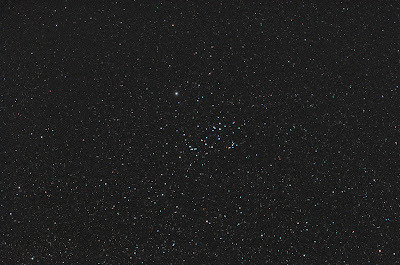 So here is a return to "normality", and an Open Cluster near the top end of Ophiuchus, small but neat and blue. Stacked by Sigma Average in Astroart and finally fiddled with in Photoshop. 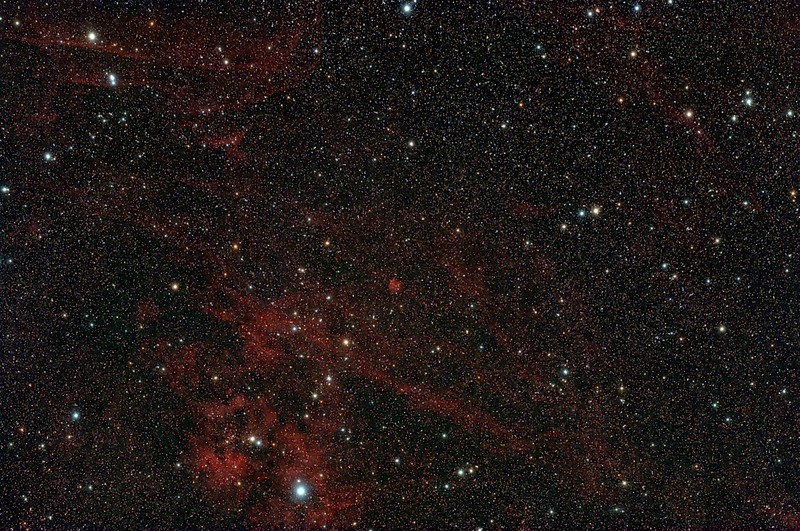 Note the long diagonal string of stars to the right centre. The Joynes String?